When The Beatles were suspected to be behind this release, Ringo was assumed to be lead singer. Note that the catalogue number and date place the release bang in-between Hey Jude and Get Back. 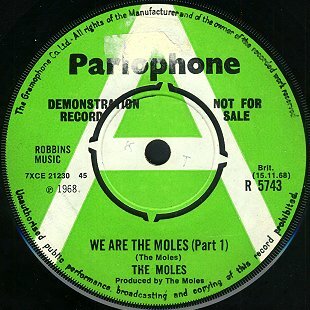 Allegedly the tape of the recording for this single was left in a train station locker and the key sent to a major English music publication with a letter stating that the tape should be released on ther Parlophone label. This story is unlikely and the truth is simply that a publicity rumour was circulated to the music press and to Disc Jockeys that it was recorded by The Beatles and for a short time it was known as "The Beatles in Disguise". The record was doing quite well picking up sales, when Syd Barrett gave the game away. 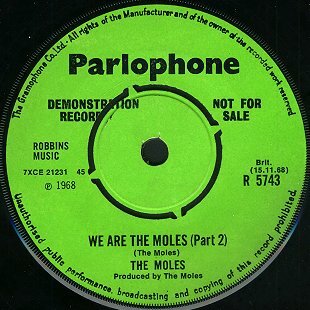 Interest immediately waned in The Moles. In more recent compilations the real composers are listed as King/Shulman. The song had been recorded at Trident Studios. ©2005 Graham Calkin's Beatles Pages. All Rights Reserved.